"This cevapcici (pronounced 'che-vap-chee-chee') recipe is from my husband's family who live in Trieste, Italy. I've added hot Hungarian paprika and nutmeg to mine, to make them spicier. These are great for summertime BBQ plain or brushed with your favorite BBQ sauce. 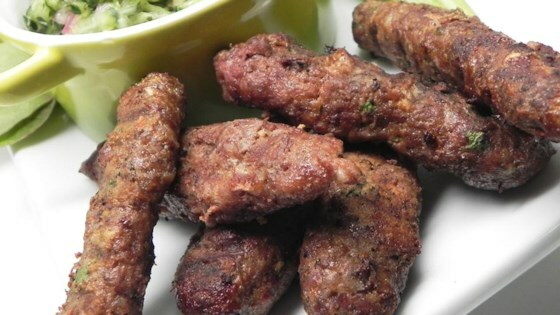 Great for entertaining, as an appetizer served with tzatziki sauce." Place beef, pork, parsley, and garlic in a large mixing bowl. Season with seasoned salt, pepper, paprika, and nutmeg. Add egg white and red wine; mix thoroughly until well blended. Cover and refrigerate for 30 minutes to allow flavors to blend. Roll the meat mixture into sticks about 1 inch thick by 3 inches long, using less than 1/4 cup of the mixture per stick. Brush the cevapcici lightly with olive oil. Cook on preheated grill until browned on the outside and no longer pink on the inside, about 12 minutes. We prefer Cevaps made with lamp/beef/pork and always Vegeta and soda water which makes them moister and helps them brown. We make them Serbian style and serve with Lapinja bread. I used the revised version from TiKiWaHiNe's comment.I served this with pasta and tomato sauce everyone thought I had grilled the meatballs and loved them yum! My Mom even asked for the recipe. I used elk burger in place of the beef and cut back on the hot paprika by half. I will definitely be trying the revised recipe as TiKiWaHiNe suggests. Need to find some Vegeta!